Listed below are the US Quarters along with an image and a short description. More information and stats will be added in the near future. Bust Quarter (1796-1838) - These early silver quarters were made of a composition of .8924 silver and .1076 copper. Designed by Robert Scot, the first Chief Engraver of the United States Mint (1793-1823), these US Quarters had a weight of 6.74 grams and a diameter of 24.3 mm. They were all minted in Philadelphia and have no mint mark. Draped Bust (1796-1807) - includes the Small Eagle reverse variety (1796) as well as the Heraldic Eagle reverse (1804-1807). Capped Bust (1815-1828) - includes the large diameter variety (1815-1838) and a reduced diameter variety (1831-1838). 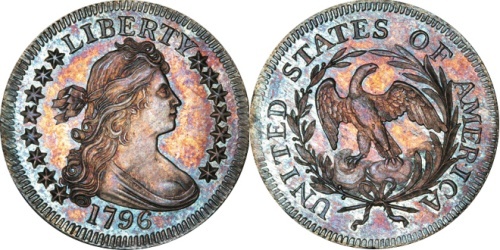 Liberty Seated Quarter (1838-1891) - These 10% copper and 90% silver quarters have a diameter of 24.3 mm. The weight was changed a few times over the life of the coin ranging from 6.68 to 6.22 grams. They have a reeded edge and were minted at the Philadelphia, New Orleans, San Francisco and Carson City Mints. 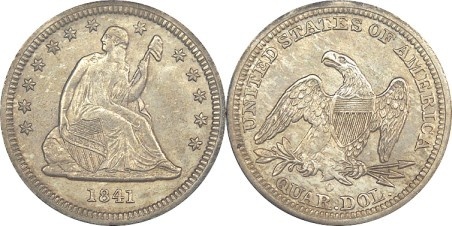 The mint mark is located on the reverse below the eagle. 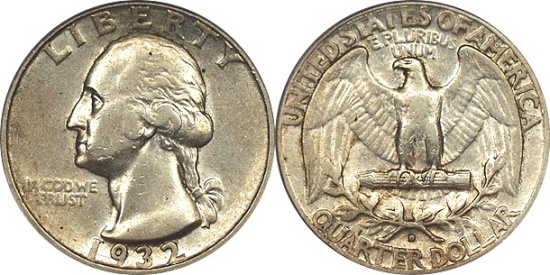 There are several varieties of the Liberty Seated Quarter. 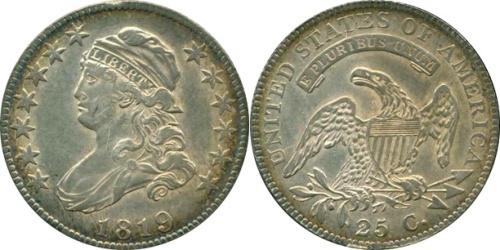 Barber or Liberty Head (1892-1916) - Charles E. Barber designed these silver quarters as well as other silver coins of this type. You can find his initial, 'B', at the truncation of the neck of LIBERTY. These US Quarters are composed of 90% silver and 10% copper and have of weight of 6.25 grams. Standing Liberty Quarter (1916-1930) - The Standing Liberty type of US Quarters was designed by Hermon A. MacNeil and also had a composition of 90% silver and 10% copper and weighed 6.25 grams. You can find the initials of the designer above and to the right of the date. There was an interesting change to the coin in 1917 to cover LIBERTY's exposed breast. Changes were also made to the reverse of the coin at this time. 1925 once again saw a change in the coin, when the date was set into a depression because of problems with the dates of the earlier coins wearing off easily. 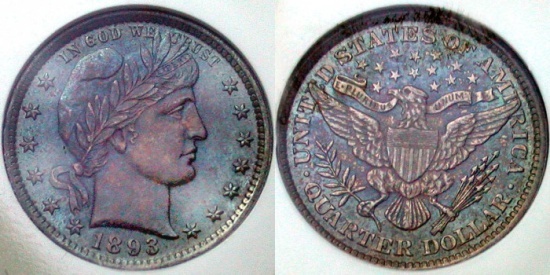 The Standing Liberty Quarter has two varieties and was produced at Philadelphia, Denver, and San Francisco. Washington Quarter (1932 to date) - The Washington type of US quarters was actually intended to be a commemorative issue to mark the 200th anniversary of the birth of George Washington. It was designed by a New York sculptor by the name of John Flanagan. His initials 'JF' can be found at the base of Washington's neck. Early issues, 1932-1964, were silver quarters weighing 6.25 grams and were composed of 90% silver and 10% copper. With a diameter of 24.3 mm and a reeded edge, these early silver quarters were minted in Philadelphia, Denver and San Francisco. Washington quarters dated 1965 to date are clad coinage with an outer layer of 75% copper and 25% nickel and an inner core of pure copper. They weigh 5.67 grams with a diameter of 24.3 mm and a reeded edge. Bicentennial Quarter (1976) - The Bicentennial Quarter commemorates the 200th anniversary of the independence of the United States. Half dollar and dollar bicentennial coins were also issued during this time. 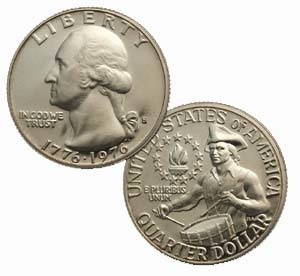 Actual minting of the Bicentennial coins occured in both 1975 and 1976, however since all coins bear a dual date of 1776-1976, it is impossible to tell which coins were minted in 1975. The designer of the reverse of the Bicentennial Quarter was Jack L. Ahr who won a contest put on by the U.S. Treasury Department. As the winner of the design for the bicentennial quarter, Mr. Ahr received $5000. John Flanagan's design from earlier issues was continued on the obverse or front of the bicentennial quarter with the exception of the dual date - 1776-1976. 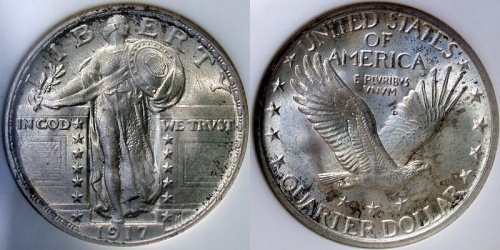 These quarters have the same composition, weight and size as other Washington quarters dated 1965 and after, as mentioned above, however they were also minted in a 40% silver version. State Quarter (1999-2008) - US Quarters commemorating each of the 50 United States of America were issued beginning in 1999, with five state quarters issued each year until 2008. They were issued in the order in which each state joined the union. Each state designed the reverse of a coin according to guidelines set out in the 50 States Commemorative Coin Program Act. America the Beautiful State Quarter (2010-????) 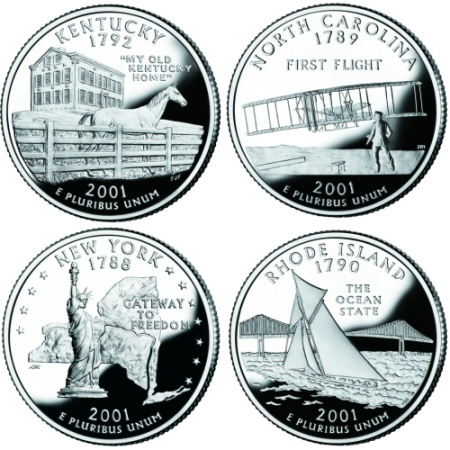 - Beginning in 2010, new state quarters that depict National Parks and other historic sites of the United States add 56 new designs for collectors of state quarters to add to their collections. The quarters will be added at the rate of five per year just like the Statehood Quarters Program. Your local bank - a great place for getting modern coins for your collection.